The well-known Brazilian magazine Super Interessante, part of the giant media group Abril Comunicações S.A., has just launched a “new experience” with November’s issue. The publication is accepting Bitcoins from the readers who want to have immediate access to some of the magazine articles. This new edition has some articles dedicated to cryptocurrency. “In the November issue, you will meet a neighborhood in Berlin where Bitcoin is replacing conventional money”, Super Interessante announced on its website, obviously talking about the Kreuzberg district. The magazine also reserves some pages to talk about how Bitcoin became more valuable in recent years and how the Internet allows the users to make simple and quick transfers. Like we said before, you don’t even need to wait for the magazine to come out to discover more about cryptocurrency. Just click here and buy the articles online immediately. Some of them are translated to English, so the experience can reach readers from other parts of the world. 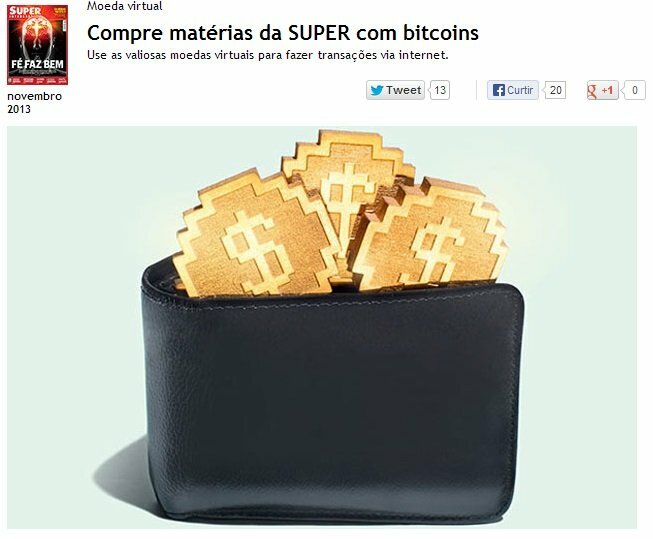 To help the newcomers, the magazine is also providing some tips about how to buy and use Bitcoins. Although for some people this might be just another business accepting cryptocurrency, it’s more than that. The holder of Super Interessante, the group Abril Comunicações S.A., is a powerful brand, one of the biggest in the country. Which means that, if this experience goes well, we could be watching the beginning of a small revolution in Brazil.